Aqua Bath Coatings are specialists in bathroom suite repair & restoration for both domestic and commercial customers. Our master craftsman can repair any type of bath, including Cast Iron, Pressed Steel, Acrylic, Roll Top and Slipper. We can even recolour a bath suite. 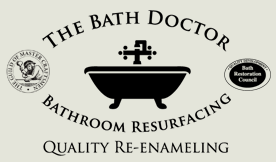 Aqua Bath Coatings owner, Stephen ‘The Bath Doctor’ Lowe, is an expert craftsman, with specialist skills and many years of experience in restoring your bath back to it’s original showroom condition. Aqua Bath Coatings can fix a multitude of problems caused by general use or accidental damage, such as cracks, chips, holes, rust and enamel defects. For private home owners and domestic customers who require repair or restoration assistance with your bath or sink. For commercial customers who require repair or restoration assistance with your bath or sink, such as Hotes & Guesthouses, Home Builders, Councils, Estate Agents & Landlords, Interior Designers, Insurance Companies and Schools & Colleges etc. If you’re looking to relocate your bath or sink taps to another area, free standing or wall mounting and require existing hole masking and new hole creation. We offer a range of reclaimed baths, sinks & cast iron radiators. In addition to restoring reclaimed pieces you may have acquired yourself.